A deep trough over WSW Europe continues east into central Europe and northern Mediterranean, pushing a frontal system towards Italy. 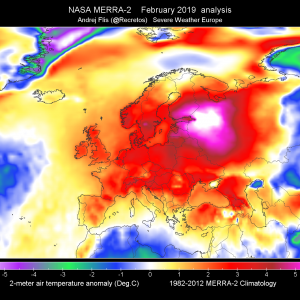 A high pressure system strengthens across the Balkan peninsula. A SFC low with a cold front rapidly moves across SW Iberian peninsula in the morning hours. A MDT risk has been issued for SE Switzerland and W Austria with threat for extremely severe non-convective winds in excess of 120 km/h across the broader area. In response to a sharp pressure gradient across the Alps, a large scale downslope Föhn event will develop from the southerly direction. Some valleys could reach peak wind gusts between 150 and 180 km/h. ENH/SLGT risks have been issued surrounding the MDT risk area where lesser extent and coverage of severe winds are expected. 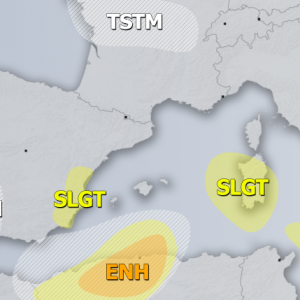 ENH/SLGT risks have been issued for parts of NW Mediterranean into extreme NE Spain where severe winds in the wake of the frontal system are expected, wind gusts could locally peak near 130 km/h. 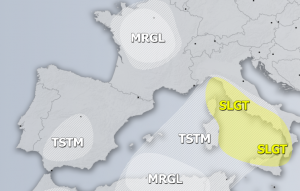 A SLGT risk has been issued across S France, N Mediterranean and across Corsica towards the W coast of Italy with threat for severe storms with severe winds, torrential rainfall and marginally large hail. Some tornado threat exists especially near the enhanced helicity areas along the coasts. 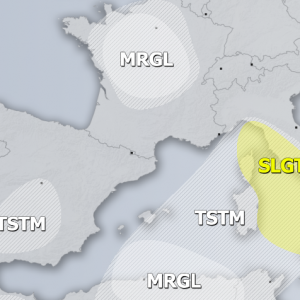 A SLGT risk has been issued across SW Mediterranean and along the N coast of Algeria with threat for severe winds, locally reaching up to 110 km/h. 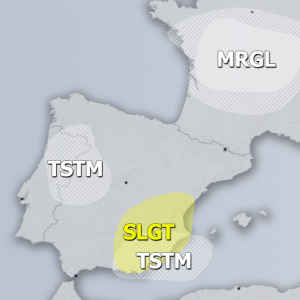 A SLGT risk has been issued for SW Iberia, Gibraltar and extreme N Morrocco with threat for severe storms with severe winds, torentiall rainfall and lesser extent for tornado or two. A TSTM+ has been issued across SE Turkey into N Middle East with threat for briefly organized storms with threat for torrential rainfall, large hail and severe winds. A TSTM areas have been placed across France into S UK where scattered sub-severe storms are likely.